The Yorkshire Hotel (or the Yorkshire Stingo Hotel, or just “The Stingo” depending on who you ask) has been on our list for quite a while, and to be honest I’m floored that it has taken us nearly 9 years to get to it. Recommended to us multiple times it just kept getting pushed down the ladder (and for a while there I could’ve sworn we already visited). However its time has come, and last night we ventured to Hoddle Street to try out the parma at the Yorkshire Hotel. A stone’s throw from the MCG this would be a great pub to pop into before the footy (especially if you are a Collingwood supporter as there is Pies merch everywhere). The Stingo manages to retain its old-world corner pub vibe so close to the CBD. 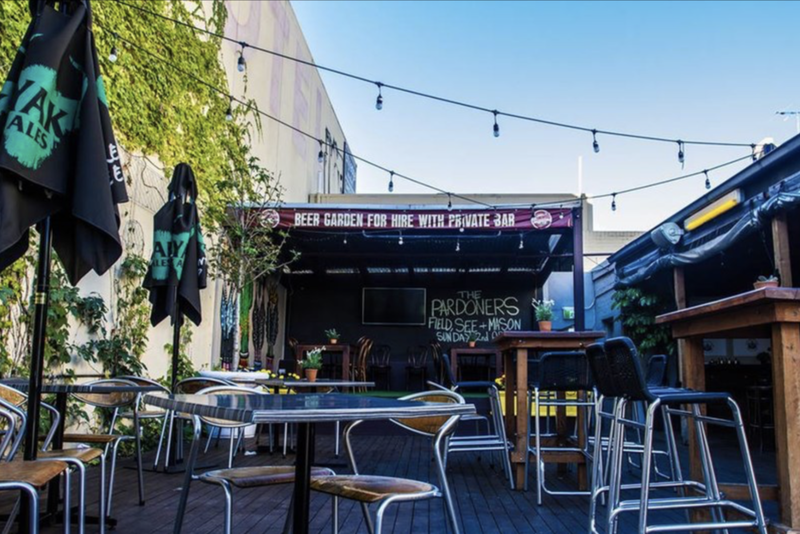 I have seen the Stingo claim to have “Abbotsford’s best beer garden”, and if it weren’t for the fantastic beer garden just opened at the nearby Park Hotel I would have to agree with them… But it’s still pretty damn good. Open and spacious with a pool table, TAB machine and a selection of arcade games (Time Crisis II, Street Fighter, Big Buck Hunter and NBA Jam), it reminded me of one of one of The Great Northern, one of my favourite Melbourne beer gardens. We ordered at the bar, for the first time this year we weren’t parma-ing in oppressive summer heat so it was a perfect night to make use of the aforementioned beer garden. We pulled up a seat and waited for our meals to arrive. The tap list at the Stingo surprised me. Got the full gamut here, at the time of writing this review we had (deep breath) Pirate Life IPA, Carlton Draught, Collingwood Draught, Coldstream Golden Ale, Coldstream Cider, Pirate Life Pale, Young Henry’s Newtowner, McCrackens Amber Ale, 4 Pines Summer Ale, Great Northern, Melbourne Bitter and Frothy… Phew. Long story short I’m pretty sure anyone could find a drop they like in that extremely varied tap list. I’m not normally one to complain about parmas stacked on chips. My official position is that 95% of the time it doesn’t bother me, and in the case a parma arrives stacked on the chips any parma pro worth their salt can de-stack before any damage is done (and in the long run I’d rather have more chips stacked than less chips because the plate is too small). However the plate the Stingo used was quite large with a heap of empty space. The chips were rescued before any damage was done, but it boggles my mind that they went the stack with so much extra space that could have been utilised. No points deducted for this or anything as it doesn’t bother me that much, just an observation. The schnitzel was pretty great quality. Well cooked and juicy. The crumbs were a little thick for my liking but not criminally so. Despite being on a large plate and possibly looking a little small in the photos it was big enough that I didn’t walk away hungry in the slightest. Overall a solid foundation to the parma. The toppings were quality all round. Plenty of cheese, plenty of napoli and they went the extra step and included a slice of ham. The cheese was well browned and the napoli sauce rich and chunky. I appreciate the inclusion of ham but couldn’t really taste it amongst the other toppings. Something with a bit more oomph would have really brought this parma to life. As far as chips go these were pretty spot on. A pretty massive serving, well seasoned, served piping hot with a solid crunch, and the offer of tomato sauce or Sriracha on arrival was greatly appreciated. The salad was … controversial. On its surface it was your standard garden salad. Lettuce, tomato, cucumber and plenty of onion, just how I like it. However the Stingo has decided to also load it with what appears to be pickled fennel? (the yellow stuff you can see in the above photo). It had such a strong flavour that it totally overrode all of the flavours in the salad (and even a bit of the parma). If you like fennel then you’ll probably love this. I was not a fan and would be happier to see it stricken from both the Stingo’s parma and the planet Earth in its entirety. I’d happily pay $24 for this parma again. It’s a little bit pricey, but I was happy enough with what I received that I’d order it again without question. If you feel like a bargain the Stingo parma is $10 cheaper on Monday night, definitely worth checking out if you’re a local. Local pubs in the inner suburbs are becoming a rarity, so it’s fantastic to see the Yorkshire still going strong. Its a quaint little pub with an old school vibe and a stellar beer garden that I’d happily drink away the afternoon in. Despite a couple of missteps the parma is overall quite good and definitely worth checking out if you’re in the area.